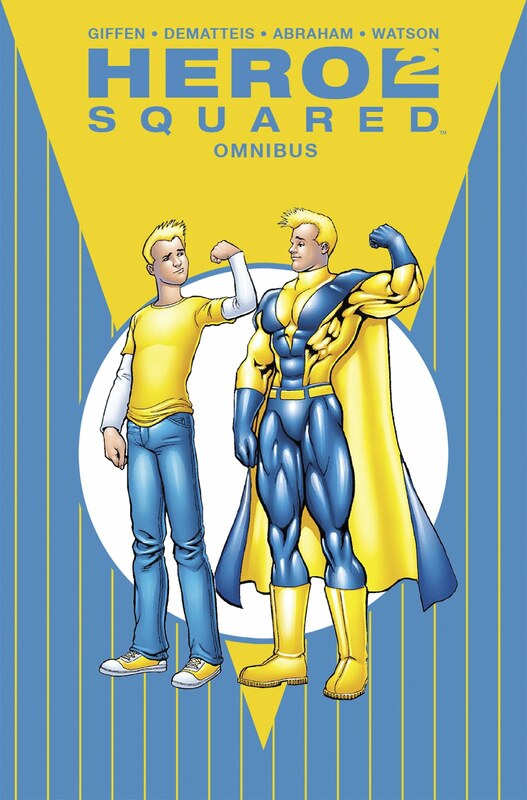 Next week will see the release of the Hero Squared Omnibus: a massive collection that gathers every Hero Squared and Planetary Brigade tale created by yours truly and some guy named Giffen and includes lots of juicy extras. (We're in comics shops on the 30th, Amazon on September 5th.) I've written an introduction for the new edition and you can read it below. Enjoy! Thirty years. That’s how long it’s been since Keith Giffen and I started writing together, partnering with the great Kevin Maguire on what’s become a somewhat legendary (or, if you prefer, infamous) run on DC’s Justice League International. Hero Squared—which launched in 2004, via Ross Richie’s pre-Boom! Studios imprint, Atomeka Press—was a little different. The original idea was Keith’s but, once I’d enthusiastically signed on, we talked regularly, and in-depth, about the series, discussing the characters, the stories, where we wanted them to go; but, because our approach remained as anarchic as it was back in the Justice League days, our conversations didn’t necessarily reflect what ended up on the page. Once Keith started plotting (and, for most of H2’s run, he dispatched with the mini-comics and wrote what was, essentially, a guide draft: check out the extras in the back of the book to see how the process worked), the final product might have nothing to do with what we'd talked about. Once I started scripting, I'd go off and follow the muse wherever it led me. I don't know if that kind of creative relationship would work for other people, but it certainly worked—and still works—for us, pushing us both to be better. A word about our Hero Squared collaborators: Joe Abraham was an unknown quantity to me when we started working together, but I soon became one of his biggest fans and boosters. Joe has the ability to bring life, heart and humor to both the quieter, more human moments—very few artists could draw an entire issue that takes place in a therapist’s office (perhaps my favorite Giffen-DeMatteis story ever) and sell it the way Joe did—and then break out the big guns for spectacular action sequences. He’s a massive talent and one of the nicest guys in the business. Then there’s our aforementioned publisher, the estimable Mr. Richie. When we started work on Hero Squared, Ross was basically holding up the world alone, trying to build a brand-new comic book line from his living room. I have warm memories of the many long conversations we had back then, discussing everything from comics to spirituality. There was a distinctive Mickey Rooney-Judy Garland “Let’s put on a show right here!” feeling to those early Boom! days and that only added to our creative energy. Watching, over the years, as Ross turned that living room endeavor into the impressive, and very successful, Boom! Studios of today has filled me with no small measure of pride. And in the end it all comes back to Giffen. It still amazes me that Keith and I have been working together this long. Well, maybe it’s not so amazing: Despite the fact that Keith desperately wants people to think that he’s surly and cynical, Earth’s Biggest Malcontent, he’s actually an incredibly nice guy: as gifted, and generous, a collaborator as I’ve ever had. When people ask me what it’s like to work with Giffen, one story inevitably comes to mind. I’ve told it before—apologies if you’ve heard it—but it really defines the man. It’s the late 80’s. We’re standing in the halls of DC Comics on a Friday afternoon. Keith is telling me his idea for the origin of one of our most ridiculous characters, the brain-dead Green Lantern named G’nort. He spends five or ten minutes spinning the entire tale, in detail. You can see he’s excited. He likes this wonderfully goofy story and he wants to do it—just the way he’s envisioned it. The problem is, I don’t like it. And I tell him that I don’t. Does Keith get angry? Does he tell me I’m a talentless jackass who has no right passing judgment on his incandescent genius? No. He just looks at me for a second, takes a breath, shrugs—and then launches into an entirely new origin of G’nort, which he’s creating on the spot. And it’s perfect. I can’t think of many people who could switch creative gears like that, but Keith has more raw creativity than just about anyone I’ve ever known: a tsunami of epic tales, memorable characters and odd, brilliant notions. Or maybe it’s just because we had so much fun creating the stories collected in this mammoth volume. Looking forward to this, Mr D - heard only good things about it since it's original run. What with this and the upcoming JL omni, I'm in comics heaven! I love the G'Nort origin story, by the way. What a testament to the incredible collaborative relationship you and Giffen have - lesser teams would've argued - but I guess G'Nortin' can come between you guys! No, it can't! And to top it all off, I added almost a whole OTHER story on top of Keith's plot. That's the Giffen-DeMatteis way! Hope you enjoy the H2 OMNIBUS, Karlos. Out of all the things Keith and I have done together over the years, this one's my favorite. Wow. I might actually buy this one. Usually, when you announce a trade, I have already bought the original issues, like an idiot. An IDIOT. But, my local comic shop had spotty pick ups in those early days of Boom studios, so I am missing some. This might be more cost effective. I don't really know how to feel about this. I don't know, I'm just hoping Scoobs Apocs holds out, because my monthly comic purchases is dropping like a rock. SCOOBY is around for the duration, Jack (translation: as long as sales hold up), and we seem to be doing fine at the moment. Hope you enjoy the H2 collection. Along with all the stories, there are plots, scripts, development art, all kinds of fun things. well, I'll have to see how many issues I need. It may be more cost effective to seek out the issues. I hop Scoobs Apocs endures. The idea of reading no comics is rather unappetizing. 'm already at the lowest I have ever been since I was 16. I hope SCOOBS APOCS (there! I said it!) endures, too, Jack. And I hope you enjoy the rest of HERO SQUARED no matter how you read it. No you typed it. When you SAY it, you'll never want to call it anything else. Scooby Apocalypse needs to continue! I need my Secret Squirrel fix! We've been having a blast with Secret Squirrel, Douglas—and, worry not, SCOOBY is not going anywhere (unless there's something DC isn't telling me)! I need to get this omnibus. I read the BOOM Studios TPB from a while back. If memory serves, it promised an upcoming monthly series, which I guess never materialized? Anyway, I lost track of HERO SQUARED, and never picked up the last mini when it came out. Didn't have the PLANETARY BRIGADE stuff either. Really good price for getting all the material in one book. And yes, Secret Squirrel has been great! And, yes, I've been having a blast with Secret Squirrel! Read the entire HERO SQUARED saga this weekend and LOVED it. Some of your best character work (and that's saying something). And wow, did you guys stick the landing! I would love to see it realized as a live action film. There's something really special (and unique) here. It wouldn't even break the bank, since it's much more intimate and character-driven than the typical superhero movie. Very glad you enjoyed it, David. And, yeah, I think it'd make a TERRIFIC movie. We had a live-action TV deal a few years back, Keith and I even wrote a few drafts of a script, but, in the end, it never made it on the air. I just finished reading THE PLANETARY BRIGADE stuff and it was awesome. Any plans to possibly continue their adventures? I feel like you and Keith could probably churn out great stories in that universe for fifty years. Just feels like an inexhaustible resource. Thanks, David. Keith is currently under exclusive contract to DC, so we can't do anything with the characters right now, but we'll see what the future brings. I think the H2 universe is ripe for further exploration. We could do an entire line of books!